Handbell Musicians of America is dedicated to advancing the musical art of handbell/handchime ringing through education, community and communication. 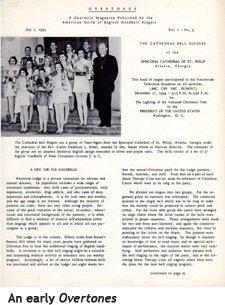 The love and enthusiasm for handbells in America sprang from the hands of Margaret Shurcliff of Boston, Massachusetts. In 1902 she became the first American woman to ring a complete peal on tower bells in England. She also rang two peals on handbells, and she was presented with a set of eight Whitechapel English handbells, which she continued to expand. Margaret was also honored with a membership in the Ancient Society of College Youths, England’s oldest and most respected ringing society. She introduced many friends to the joys of handbell ringing, and her Beacon Hill Ringers, consisting of five of her six children and several friends, became well known for their annual Christmas caroling on Beacon Hill. The popularity of handbells spread rapidly through New England in the early 20th century, even though virtually all bells had to be imported from England. 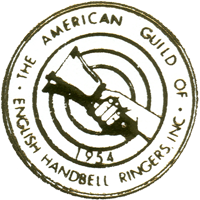 In 1937 several handbell enthusiasts met at Margaret’s home and formed the New England Guild of English Handbell Ringers (NEGEHR), with Margaret serving as its first president. Members of NEGEHR exchanged music, ideas, and techniques. As far as meetings were concerned, the members would gather one evening each spring for supper, hold a business meeting, and then finish the night with a public concert. The AGEHR held its first festival at the Crane Mansion on Castle Hill in Ipswich, Massachusetts. 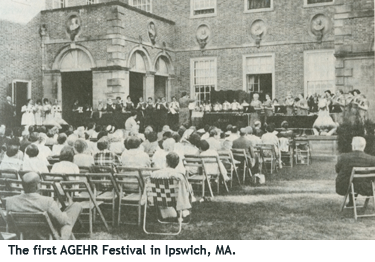 Despite having difficulty recruiting twenty-six participants, the minimum number required by the Mansion for a meeting, 700 to 800 people turned out for a Saturday evening concert. This number far exceeded the anticipated 300 people for whom chairs were set up. Margaret resigned from the presidency in 1957 because of poor health and passed away on February 28, 1959. The roots of the AGEHR, however, were firmly planted, and the growth of the organization continued to surge ahead as Bessie Erb took over the presidency. Not until Robert Hieber took office in 1959 did officers begin to realize that the small family-like group had grown into a national organization. The board of directors proceeded to divide the AGEHR geographically from two to nine areas. In 1971 at the Morehead Festival, the AGEHR was further divided into twelve areas. The art of handbell ringing expanded rapidly in western states, and in 1961 the first western festival was held in St. Louis. By 1977 it became necessary to hold four national festivals to accommodate a total registration of 4,000 people. Overtones, the official journal of the Guild first appeared in 1955 to create a bond of fellowship with ringers throughout the membership, and to carry messages of interest and the exchange of ideas and methods among members. The first issue of Overtones was a one-sided, four-page publication of typewritten material. From 1961 to 1963, dramatic changes were seen in the appearance of Overtones, as it began taking steps toward becoming a full-fledged general interest magazine. The journal was published four times a year until 1970, when it became a bi-monthly publication. Today it is a 48-page magazine with extensive educational articles, photos, advertisements, and graphic work. 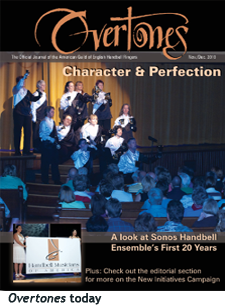 AGEHR is also a regular publisher of handbell music by the best established and rising composers as well as many resource books covering ringing techniques, conducting skills, and education. The first employee of the AGEHR was Mrs. Carl Heath Kopf of Meridian Hill Ringers in Washington, D.C. She was hired as a part-time corresponding secretary in 1962 for $100. On October 1, 1981, the national office was established in Dayton, Ohio. Andy Flanagan served as executive director, Helen Flanagan as the Overtones editor and Jeanette Finkam as the administrative assistant. The national office is still located in Dayton and employs a full-time executive director and a regular administrative staff. At its Pinnacle 2010 event in Nashville, Tennessee the AGEHR board of directors unveiled a plan consisting of three bold, new initiatives, designed to bring the art of handbell ringing into the modern era. The first of these was a major technology investment designed from the ground up to allow for a web-based solution to connect musicians, directors, and educators in a social networking environment and to allow online management of events and member benefits. Next was a rebranding and new identity. While keeping the proud tradition of AGEHR, the Guild has begun doing business as the Handbell Musicians of America, a name identifying the organization’s members as musicians to be respected and taken seriously in the mainstream music world. Finally, we restructured our membership and resources, providing more options and area-specific resources for handbell musicians working in the church, school, or community. Instead of holding a meeting once a year, the the Guild now provides numerous opportunities to gather and learn new techniques. Scores of festivals, seminars, master classes, and workshops are held at the national, area, state, and district levels throughout the year. Additional services — such as the Endowment Fund, Handbell Musician Certification, specialty newsletters, and support for special interest groups — appear almost every year. Members also have the opportunity to give back to the handbell world by serving on committees and boards, writing articles for Handbell Musicians of America publications and teaching classes. The Handbell Industry Council, which represents manufacturers, publishers, and retailers, keeps members in touch with companies and businesses that cater to the handbell industry. The 1955 Overtones listed forty-six charter members of AGEHR. 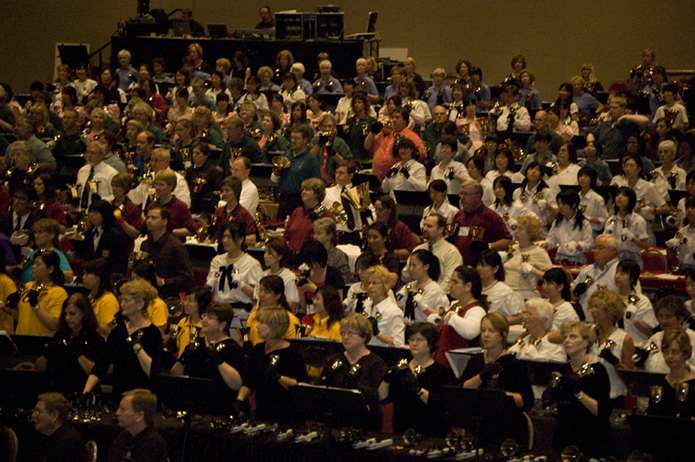 Today the Handbell Musicians of America provides benefits and services to approximately 5,000 member organizations and individuals, both national and international, representing approximately 100,000 handbell musicians around the world. Dating back to the first festival at the Crane Mansion, the Guild has provided members with quality services. Today these services far exceed what Margaret Shurcliff could ever have imagined.